ST. GEORGE — The National Weather Service has issued a winter weather advisory for the mountains of central and southern Utah and surrounding areas from 11 a.m. Thursday to 11 a.m. Friday. Several inches of snow are expected, along with possible winds gusts of up to 45 mph. 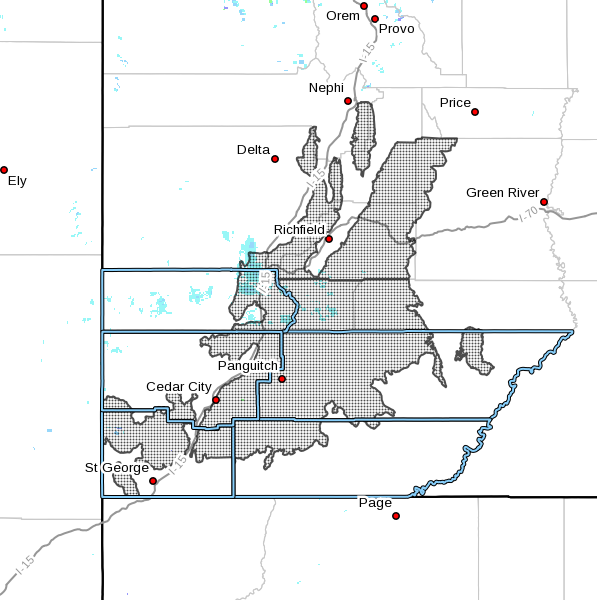 The advisory covers central and southern Utah mountains, including the cities of Cove Fort, Koosharem, Fish Lake, Loa, Panguitch and Bryce Canyon. Total snow accumulation is expected to be 8 to 14 inches or higher within the affected areas. Plan on slippery and snowy road conditions. Some roadways across the central and southern mountains of Utah may become snow-packed. Gusty winds may cause blowing and drifting of snow. A winter weather advisory for snow means that snow accumulations will make travel difficult. Be prepared for snow-covered roads and use caution while driving in the snow. Clear any frost and snow from your vehicle’s lights and windows. Make an effort to see and be seen while driving. Allow extra leeway in travel time. Expect to drive slowly in adverse weather conditions. High speeds can lead to skidding off the road and getting stuck in the snow. Take it slow. Drive well below posted speed limits and leave plenty of space between cars. Don’t use cruise control in icy or snowy conditions. Slow down in areas of limited visibility and be alert. For additional information on winter road conditions from the Utah Department of Transportation, click here. More information about winter driving can be found at the UDOT website, as well as UDOT’s Commuterlink for current road and weather conditions, or dial 511. To see other weather watches, warnings and advisories issued by the National Weather Service Forecast Office in Salt Lake City click here.